In the small southern Virginia city of Emporia, a low-income housing community – while well-managed and maintained – was in need of an upgrade to preserve the property and keep its operation cost effective. So the 22-year owner of Weaver Manor, Bob Margolis, decided to sell the community to a limited partnership composed of his two longtime business partners, Adam Stockmaster and Ari Severe, and together they would update the aging property. The team turned to Virginia Community Capital to help finance the redevelopment of Weaver Manor, a 42-unit community built under the USDA’s Section 515 program, which backs loans to affordable housing rentals for low income, elderly, and individuals with disabilities in rural areas. Weaver Manor is 95 percent occupied and has been successfully owned by Margolis’ Maryland-based real estate entity, T.M. Associates, since 1996. The community has satisfied all Virginia Housing Development Authority (VHDA) and USDA requirements and inspections. Like many USDA 515 properties undergoing upgrades, the redevelopment will offer a needed boost to enable preservation of the property. Construction was completed within all required timeframes. A city in population decline with one in three residents living in poverty, Emporia has a per capita income of $18,360 and a median household income of $27,000. Weaver Manor is a quiet community, walkable to the downtown area and nearby shopping and restaurants. Households earning less than 60 percent of the area median income qualify for apartments at Weaver Manor with reduced rent. T.M. Associates Management, Inc. was established in 1999 and has extensive experience developing communities with low-income housing tax credits (LIHTCs). T.M. Associates includes Adam Stockmaster and Ari Severe, the developers who purchased the property under the limited partnership that updated Weaver Manor. T.M. Associates has become an industry leader in East Coast rural housing developed under the USDA 515 program and has a team skilled in managing LIHTC and USDA-financed deals. The company owns and manages more than 11,447 apartment units in over 258 communities and eight states as well as Washington D.C. Affordable housing can improve quality of life and offer stability to individuals and families in a community, offering below-market rent – and sometimes reduced rents – to help them focus on paying for other necessities like food, healthcare, and family support. That’s why, as a mission-focused Community Development Financial Institution, we support developments like Weaver Manor that can positively impact the communities where they are located. 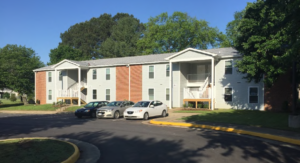 This project was supported by the Capital Magnet Fund, created by the Department of Treasury to offer low-cost financing to build more affordable rental housing in Virginia. VCC offers a variety of both mission-focused and traditional loans for real estate developers and investors: acquisition/refinance/rehab loans, construction loans, mini-perm loans, and low-income housing and historic tax credit financing. We provide financing to commercial, residential, and mission-based real estate projects, including multi-family developments, affordable housing, commercial properties, medical centers, healthy food grocers and more. Beyond lending, we’re a partner for all projects in which we invest, and our borrowers are able to tap into our vast industry expertise to learn more about best practices and observed challenges in real estate projects. We bring in experts and stakeholders to ensure every project has a plan for success and can deploy talent and resources to answer complex questions our partners may have regarding capital sources, regulations, development methods, and more.